(Nanowerk News) Scientists at JILA, working with Italian theorists, have discovered another notable similarity between ultracold atomic gases and high-temperature superconductors, suggesting there may be a relatively simple shared explanation for equivalent behaviors of the two very different systems. Described in Nature Physics ("Observation of pseudogap behavior in a strongly interacting Fermi gas"), the new research lends more support to the idea that JILA studies of superfluidity (flow with zero friction) in atomic gases may help scientists understand far more complicated high-temperature superconductors, solids with zero resistance to electrical current at relatively high temperatures. Known high-temperature superconductors only superconduct well below room temperature, but a detailed understanding of how the materials work may one day lead to practical applications such as more efficient transmission of electricity across power grids. JILA is operated jointly by the National Institute of Standards and Technology (NIST) and the University of Colorado at Boulder. 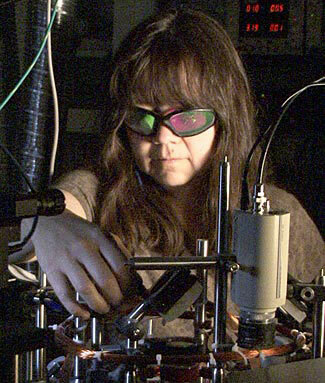 NIST Fellow Deborah Jin in her laboratory at JILA where she studies ultracold atomic gases and their similarities to high-temperature superconductors. The atoms are initially trapped and cooled in a glass cylinder located below the copper coils. The JILA group studies how atoms in a Fermi gas (a collection of noninteracting particles called fermions, one of two categories of fundamental particles found in nature –bosons are the other. Identical fermions cannot occupy the same place at the same time) behave as they "cross over" from acting like a Bose Einstein condensate, in which atom pairs form tightly bound molecules, to behaving like pairs of separated electrons in a superconductor. In the new study, JILA scientists applied a technique they developed in 2008 to explore subtle energy properties of ultracold atoms. The technique is an adaptation of photoemission spectroscopy, long used to probe the energy of electrons in materials. A superconductor research group recently used electron photoemission spectroscopy to find evidence of electron pairing above the critical temperature where the material switches from a superconductor to a regular conductor. Why this duality occurs is a subject of debate. The JILA scientists performed comparable measurements for an ultracold gas of potassium atoms at and above temperatures where superfluidity disappears. Like the superconductor group, the JILA team found evidence of atom pairing above the critical temperature. This demonstrates the existence of a so-called "pseudo-gap region" where the system retains some pairs of correlated fermions but not all characteristics of superfluidity. The findings were made possible in part by significant improvements in the signal strength of the atom photoemission spectroscopy technique since 2008. "What makes this really interesting is that the two systems are actually very different, with the high-temperature superconductor being much more complicated than atomic gases," says NIST/JILA Fellow Deborah Jin. "The observation of similar behavior with similar measurements suggests that having a pseudogap phase does not require complicated explanations, such as lattice effects, two-dimensionality, or exotic pairing mechanisms." Co-authors of the new paper are theorists from the Universita di Camerino in Italy. The research was funded by the National Science Foundation.